After coaching countless athletes across the Chesapeake region to state, conference, county, and even collegiate All-American accolades, Michael Rainbow begins his first season with Virginia Elite as the Setting Academy Lead and 17’s Head Coach. Originally from Wilmington, Delaware, Rainbow played club and high school volleyball before graduating and playing for the University of Valley Forge. 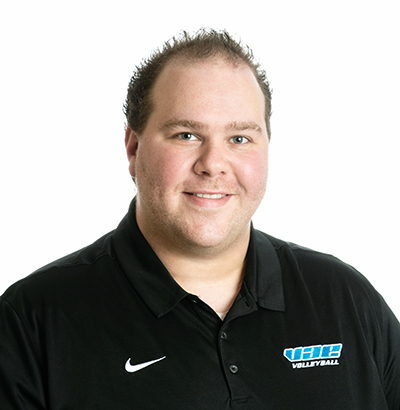 He has coached for 13 years at the club, high school, and collegiate levels, most recently as the head coach of the 18 National teams at both Maryland Juniors and Columbia Volleyball Club. Rainbow previously coached at Mount de Sales Academy in Catonsville, Maryland, and is currently the head coach at Liberty High School, where he was named as the 2014 and 2015 Carroll County Times Coach of the Year while leading the Lions to back-to-back conference championships and a regional championship in 2015. Rainbow is also the founder and head coach of M2 Volleyball Training based in Jessup, Maryland. He is an AVCA member and is CAP I certified. Rainbow graduated with a B.S. in Music Education and a B.A. in Music Performance from the University of Valley Forge, and a Masters of Music in Vocal Performance from The Peabody Institute of Johns Hopkins University. He currently resides in Sykesville, Maryland, and is a teacher at Liberty High School.